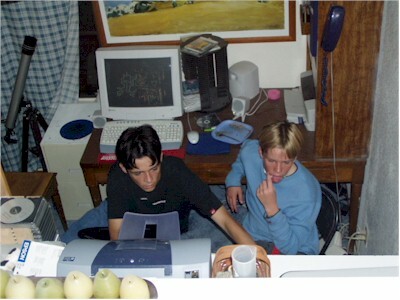 The flash and the computer are the only significant sources of light in this photo. In fact, I couldn't see a thing when I was pointing my camera in the direction of Matt and Scott's voices and keyboard clicks last night. This is our work room where homework and newsletters get done. Each computer, the Micron and the Gateway, has its own e-mail address. They're networked together with a 2Wire Home Portal and a DSL modem.